With the chill in the air growing, the days getting a little shorter and the nights lengthening to match, it must be fall. That means, for a lot of people, pumpkins. Whether planning to carve them, bake them, or use them in some kind of dessert for the upcoming Thanksgiving season, the good news about pumpkins is that this is their key time of year. In Michigan, there are lots of places to get pumpkins, but some are just better than others. So let's have a look at 10 great places to find pumpkins...and a whole lot more in Michigan. Pumpkins are just one of the offerings on hand at Friske's, and those hoping to make a quick stop off for just a pumpkin will likely either change their plans or regret it deeply. Ellsworth's impressive pumpkin operation not only offers the massive gourd, but also a slate of other farm goods including apple picking-along with the inevitable cider-and-donut combination that screams fall-but also wagon rides and other season shopping. The kids can even check out a variety of barnyard animals as well as Orchard Playland, opening up opportunities for running and playing. Those in the area of Petoskey, meanwhile, will have more than the area's namesake stone, which is also the state's official stone, to look for. Out at Coveyou Scenic Farm Market, shoppers will not only land pumpkins, but also most everything else that could make a good breakfast to go with it, including fresh-from-the-hive honey and eggs. Brace your wallet-and your stomach-if you head out to Traverse City's Gallagher's Farm Market. Naturally, pumpkins are on hand, but so too are a complete roster of tasty Michigan delicacies. Pick up cherry jams, homemade salsa, dried and chocolate covered cherries, pastries, pies and breads, cheese and even local wine to round it out. Those looking for a homemade snacking heaven will have plenty to see at Gallagher's. Those on the western side of Michigan can swing over to Coloma, where the Jollay Orchards are waiting for pumpkin pickers, apple pickers, and most any seeker of natural fall fun. 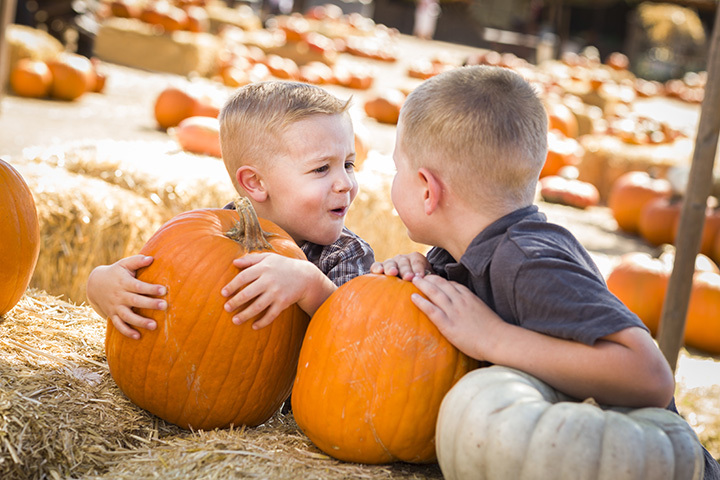 With over 10 acres of pumpkin patches to its credit, Jollay Orchards should have the pumpkin of your dreams on hand. Past that, those new to apple picking or apple buying can consult with orchard experts who will help make sure every crisp, sweet mouthful is its best. As Halloween draws near, so too does new fun, with a haunted house and other activities for the kids afoot. Out near Saginaw, Johnson's Giant Pumpkins offers exactly what the name suggests, giant pumpkins for those prepared to go big or go home. Naturally there's more happening than this, including a corn maze that spans 13 acres, and for the younger kids, a soybean maze which offers a chance for life-sized maze fun that still stays in sight of mom and dad. Craft stores, the ubiquitous donuts and cider, and even some special events like chainsaw carving expeditions improve a weekend even further. Home to Farmer Charley's Corn Maze, there are pumpkins aplenty out at Monroe's Farmer Charley's, as it's sometimes called. But Kackleberry Farms isn't just home to pumpkins to display or bake with. Kackleberry Farms also has ammunition pumpkins. Home to the pumpkin cannons, those who come out can not only watch pumpkins get fired from cannons, but can even, by some reports, do some of the firing themselves. If you've ever wanted to shoot a pumpkin out of a cannon, here's the place to try it. Head to Northville's Ostbaum Orchards for a big orange pumpkin and a variety of other beautiful festive gourds! Make sure to go on a hayride, sip on some fresh cider, and pick up doughnuts, too. At Debuck's in Belleville, you'll find a pumpkin patch and a pretty complex corn maze, among other fall classics. The pumpkin patch here is incredibly impressive, spanning 20 acres and featuring a whole variety of bright orange gourds to choose from. You'll want to take home a whole wagon full. Come and get a slice of history with your pumpkin in Armada's own Blake Farms! One of the first "Pick Your Own" orchards ever established in Michigan, the farm offers apples, pumpkins, corn mazes, pony rides, and more on its 500-acre spread. For those not familiar with acreages, that's about three quarters of a square mile. Just to top it off, reports note that the apple cider there has won awards previously. Dowagiac's own Sprague's is home to a host of autumn joys, including pumpkins, apples, and a corn maze measuring a reported 6.5 acres. A slate of baked goods is on hand, and those interested can even pre-order treats through the website to make sure exactly what's desired is on hand. The best news about this farm, though, is that it doesn't stop at fall fun like others do. Those who want summer produce can also come in during the summer, so start showing up in summer, and keep right on coming back through fall.